"A successful Wall Street trader turned Cambridge neuroscientist reveals the biology of boom and bust and how risk taking transforms our body chemistry, driving us to extremes of euphoria and risky behavior or stress and depression"
The laws of financial boom and bust, it turns out, have more than a little to do with male hormones. In a series of groundbreaking experiments, Dr. John Coates identified a feedback loop between testosterone and success that dramatically lowers the fear of risk in men, especially younger men significantly, the fear of risk is not reduced in women. Similarly, intense failure leads to a rise in levels of cortisol, the antitestosterone hormone that lowers the appetite for risk across an entire spectrum of decisions. Coates had set out to prove what was already a strong intuition from his previous life: Before he became a world-class neuroscientist, Coates ran a derivatives desk in New York. As a successful trader on Wall Street, "the hour between dog and wolf" was the moment traders transformed-they would become revved up, exuberant risk takers, when flying high, or tentative, risk-averse creatures, when cowering from their losses. Coates understood instinctively that these dispositions were driven by body chemistry and then he proved it. 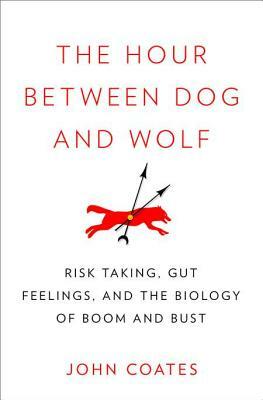 "The Hour Between Dog and Wolf" expands on Coates's own research to offer lessons from the entire exploding new field the biology of risk. He brings his research to life by telling a story of fictional traders who get caught up in a bubble and then a crash. As these traders place their bets and live with the results, Coates looks inside bodies to describe the physiology driving them into irrational exuberance and then pessimism. Risk concentrates the mind and the body like nothing else, altering our physiology in ways that have profound and lasting effects. What's more, biology shifts investors' risk preferences across the business cycle and can precipitate great change in the marketplace. Though Coates's research concentrates on traders, his conclusions shed light on all types of high-pressure decision making-from the sports field to the battlefield. "The Hour Between Dog and Wolf "leaves us with a powerful recognition: To handle risk in a "highly evolved" way isn't a matter of mind over body; it's a matter of mind and body working together. We all have it in us to be transformed from dog into wolf; the only question is whether we can understand the causes and the consequences. John Coates is a senior research fellow in neuroscience and finance at the University of Cambridge. After completing his Ph.D., Coates worked for Goldman Sachs, Merrill Lynch, and Deutsche Bank in New York, where he observed the powerful emotions driving traders. He returned to Cambridge in 2004 to research the effects of the endocrine system on financial risk taking. Coates s work has been cited in several publications, including "The New York Times," "Wired," and "The Economist," and he has appeared on Good Morning America, CBS Evening News, and the BBC. His writing has been published in "The Financial Times" and Proceedings of the "National Academy of Sciences," among others."